In recent decades several major earthquakes have caused serious damage to wooden houses, highlighting the need for earthquake-proofing of timber structures. Existing design concepts are mainly based on the static considerations of shear-resistant walls or frames of timber structures, and thus cannot predict the behavior of severely damaged structures. Meanwhile, timber structure research has employed response analyses, large-scale tests and shaking tables, which have considerable increased understanding of the behavior of wooden houses during earthquakes. Applying this knowledge and new analytical tools based on the discrete elements method, the Japanese Building Research Institute has developed the Wallstat collapse analysis software for damage assessment and prediction of the likelihood of whole building collapse during seismic motion. Researchers and engineers who specialize in timber structures can now more readily generate their own research results. 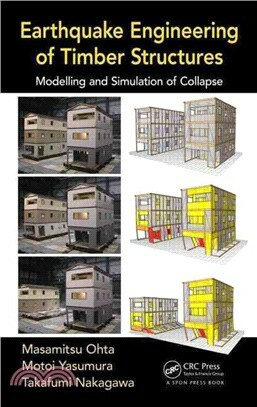 This book outlines the seismic behaviour and seismic performance requirement of timber structures and explains the concept of basic earthquake-proof design, and it provides background to the collapse analysis of timber structures by seismic loading, and explains the Wallstat software along with several worked examples.